I recently bought a Kogan 32″ Full HD 100Hz LED sidelit TV with USB PVR functionality to replace my old Kogan 32″ LCD TV because the new LED TV looks better, is much thinner, has lots more connection ports including 4 HDMI, can record digital TV to a USB drive, uses 40% less power and generates less heat in my apartment. For the price ($699+shipping @ Jan 2011) a 32″ LED is the perfect TV for an apartment or 2nd TV for your kids to watch ABC3 while the main TV is used by parents. The Kogan Elite 100Hz LED32 LED TV doesn’t have any internet connectivity features like competing LED sidelit TV’s from Sony, Samsung, Panasonic etc. This could be seen as a weakness because a “dumb tv” without an internet connection requires a separate media player like my Sony BDP-S370 Bluray internet media player to view video content on Youtube, ABC iView, SBS Catchup etc directly on your TV. Or it could be seen as a strength because people keep TV’s for several years and if you buy a “smart tv” with twitter, facebook, youtube etc built-in and some of these services shut down or change dramatically then that feature is useless. Think it can’t happen? What if TV’s had Myspace access built-in when it was the biggest online social network? A few days ago Myspace sacked half of its staff because it’s popularity has plummeted and most people moved to Facebook. I’d rather own a “dumb tv” and replace the internet/bluray player box attached to it ever year or two to get more internet content on my TV, rather than replacing the whole TV which is wasteful if the panel has no display issues. At 4.1cm its half the thickness of my old LCD TV thanks to the LED sidelit panel. There’s not much point paying a lot more for a brand name LED sidelit TV just to save another 1-2cm space. The picture quality is quite good but not top notch like an LED backlit TV, the payoff is that those are thicker and cost a fair bit more than sidelit. My old LCD Kogan TV used about 135 Watts power while on and got noticeably hot if used for several hours, especially in warm weather. There’s no such problem with the Kogan Elite 100Hz LED 32 inch TV because it uses around 75Watts at the backlit setting I’ve chosen and doesn’t get hot, just a bit warm. The 100Hz Full HD 1080p LCD panel has no issues playing any type of video content, whether it’s News, Sports, General entertainment, Movies or Photo viewing from a USB drive. Avoid TV’s with less than 100Hz eg: 50Hz because the motion for fast moving objects like Sport won’t be as smooth. Old Kogan TV’s from a few years ago had few inputs. They’ve obviously learnt that 2 HDMI ports isn’t enough because this TV has Bottom Inputs (2 HDMI, VGA, Audio In, Antenna In) and Left Side Inputs (2 more HDMI, 2 Composite, Component YPbPr and 2 USB as well as Bottom Outputs (1 Coaxial Audio Out, 1 AV Out) and a Headphone jack as a Left Side Output. The USB slots let you playback audio eg: MP3, photos eg JPG and video eg: DIVX. Total supported formats are: AVI, JPG, PNG, BMP, MP3, WMA, AAC, MPG, RM, RMVB, MP4, MOV, MKV. You can also use a large USB drive (either a thumb drive or upto 2TB external USB harddisk) to record live TV to a buffer so you can Pause/Rewind it or Record TV directly to a TS file on USB which can then be played on your computer or converted to DIVX so it can be uploaded to Youtube like I did for the launch of Channel 11. If you watch digital TV through the Kogan’s 32 inch Full HD ELITE LED TV’s in-built digital TV tuner then the red coloured menus and Electronic Program Guide (EPG) are a bit basic compared to brand name TV’s. I watch through my TiVo digital tv PVR recorder so that isn’t a problem. Similarly the remote, while including all the required buttons is quite long. The sound from Kogan’s 32″ Full HD ELITE LED TV is clear enough and can be raised to a high volume but lacks depth or bass. There’s a simple reason for that. The thinner the TV, the less space there is for speakers. The fact fact of the matter is that I haven’t been impressed with the sound of any thin LED TV’s even big brands for that reason. If you use your TV mostly to watch news and sport then you won’t care but if you use it to watch shows with a great soundtrack or DVD/Bluray movies then you’re best advised to output the TV sound to a set of good speakers such as my Aktimate Mini speakers (reviewed by AvHub). The Kogan Elite 100Hz LED32 LED television is reasonably priced, has good picture quality and offers some useful built-in features. We don’t think the interface and remote control are as good as they could be, but the Elite 100Hz LED32 is otherwise competent. For $799, we thought the Kogan ELITE LED32 was an excellent LED TV. It has reasonably fashionable styling, good picture quality, a 100Hz mode and integrated digital TV recording to USB. It’s now $699 at Kogan’s online store, which makes it an even more enticing purchase. 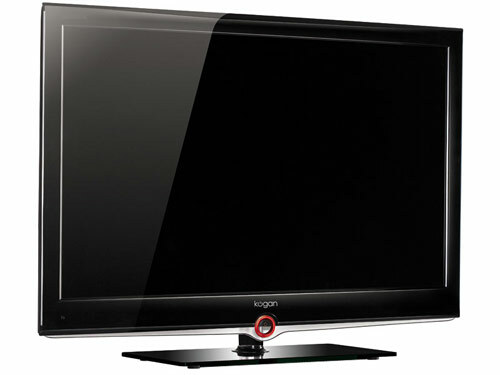 The Kogan Elite 100Hz LED32 LED Television is available from the Kogan website and sometimes they sell extra stock on Ebay as well. I have a Kogan 19″ HDTV – KGNHDLED19VBA for the spare bedroom. Works really well. Agree with you Neerav about the sound however – very “tinny” until I connected it to external speakers via a preamp (& RCA cable from the headphone output socket). The PVR function is interesting and works fine using the USB output. I did have trouble with it recording to an external 2TB WD drive however (too large?) The .ts format file can easily be played on a PC using VLC Media Player (freeware). Neerav you say that you “converted [the .ts file] to DIVX so it can be uploaded to Youtube” but I am having trouble finding software which can edit or convert the .ts format successfully. What did you use?